Has autism touched your family? I have worked with children with autism for over fifteen years and been a foster parent to a few beautiful souls on the spectrum. My dear friend, Deanna, has launched a new website that is dedicated to connecting parents and caregivers to local resources and support. I could not be more proud of her! Her son is one of Cameron and Isaiah’s most favorite pals. While Okanagan Family Autism Connection is directed towards families living in the Okanagan area it also provides resources and support to families who may have questions and are looking for answers. Having a child diagnosed with autism can be overwhelming. Having a tool like this website can make the search for resources much easier. 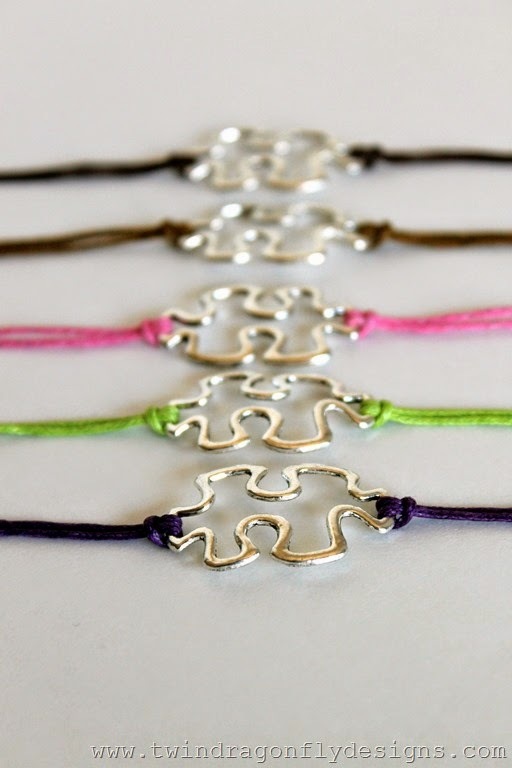 To help build autism awareness and celebrate the launch of Okanagan Family Autism Connection, Deanna and I created these awesome Puzzle Piece Bracelets! Soon you will be able to find these bracelets available on her website! If you live in the Okanagan area and are looking for autism resources and support be sure to visit the Okanagan Family Autism Connection website or “like” the Okanagan Family Autism Connection on Facebook. Help us to share this amazing new initiative! Thank you Heather for inspiring the bracelets. TONS Love to you!!! !